Senate Enyinnaya Abaribe, senator representing Abia South in the upper house and two others have been ordered by the Federal High Court Abuja to produce Nnamdi Kanu in court by June 26th 2018. Justice Binta Nyako, the presiding judge gave this order following Nnamdi Kanu’s continued absence from court. It will be recalled that Nnamdi Kanu’s whereabouts has been unknown since the Army stormed his father’s house on September the 22nd 2017. Senator Abaribe, Tochukwu Uchendu and Emmanuel Shallom Ben had all stood surety for him, signing bail bonds of N100 million each. 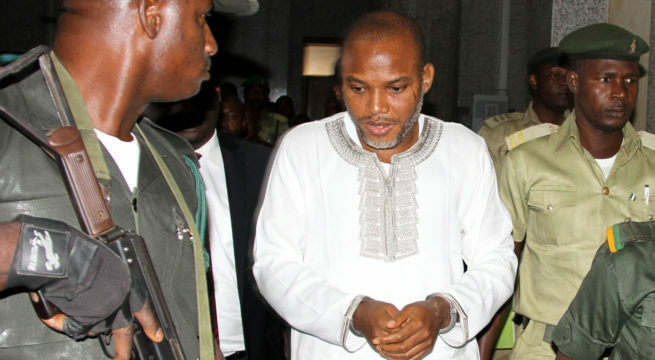 Following the continued absence of Nnamdi Kanu whose lawyers and family had declared missing following the Army attack, the prosecution had demanded of the court that the three individuals that stood surety for Nnamdi Kanu be made to answer or forfeit their bail bonds. The matter has now been adjourned to June 26th 2018 when the Defendant, IPOB’s Nnamdi Kanu is to be presented in court or his sureties will have to answer or forfeit their bail bonds or even be jailed.